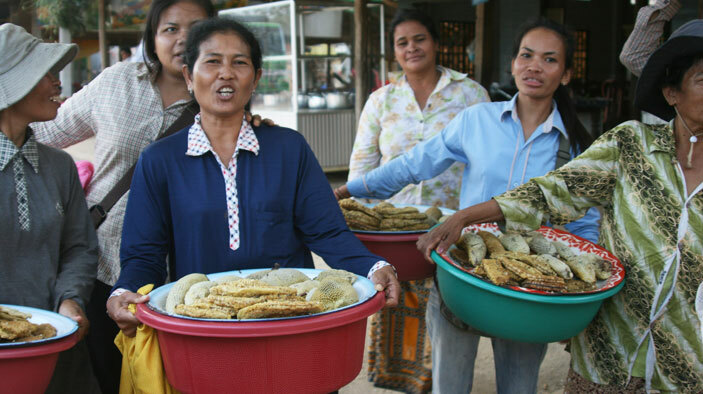 The Cambodia MSME 1 and 2 Project built upon the success of DAI-led employing a market-driven, grassroots strategy aimed at alleviating poverty and fostering economic growth in 17 rural provinces. The project worked across the aquaculture, swine, tile manufacturing, clean water, honey, resin, and ecotourism value chains. Its goals were to broadly improve technical and business skills for all value chain actors, promote strong business relationships between value chain actors and between government actors, assist MSMEs to access higher-value markets and better credit resources, and assist government and private sector to improve the business-enabling environment at the national and provincial levels. Read a third-party assessment of the project here. Help business people form interest groups to identify, discuss, and solve common problems. Link producers with private sector input suppliers that provide embedded training and technical services in a mutually beneficial and sustainable relationship. Promote relationships between less-able producers and leading enterprises to provide practical business skills training. Encourage MSMEs to improve competitiveness and reduce risks so they can qualify for loans from microfinance institutions and banks. Facilitate public-private dialogue to improve business advocacy and policy maker understanding, and bring about positive changes in the regulatory environment. The first MSME project facilitated 33 provincial-national dialogues (1,000 percent of its target), assisting 2,936 MSMEs to express their concerns to 256 government representatives. It improved small business production, such as when medical and vaccine suppliers were persuaded to market their products to small farmers, which resulted in more sales for the suppliers and healthier herds for the farmers. Overall, the project facilitated 59 training sessions for 1,963 MSMEs. MSME promoted competition, for example, when rural brick and tile makers were linked with construction firms in Phnom Penh, boosting sales for the rural businesses, while teaching them to improve the quality of their product and delivery. MSME established public-private dialogue, which in one case prompted the Cambodian government to safeguard small farmers by imposing a moratorium on pig imports until fairer trade regulations could be established. MSME 2 conducted 119 cross-provincial trips with 2,000 participants, and led 12 international visits for 186 participants to Thailand, Vietnam, Malaysia, the Philippines, and the United States.